I’ve been on a memoir kick. My extended commute gives me ample time to read, and without realizing it, books by extraordinary women have floated to the top of the pile. First, it was Madeleine L’Engle’s A Circle of Quiet (any other Wrinkle in Time fans out there? ); then, Tina Fey’s Bossypants (I cannot get over how fiercely funny and smart this book was); and most recently, Julia Child’s My Life in France. I don’t know about you, but when I picture Julia Child, I picture either the dual tomes of Mastering the Art of French Cooking, or a tall-but-hunched-over, older lady on PBS. I’ve always understood that she’s legendary, and even perhaps understood why, but never did I imagine I’d be so captivated by a recounting of her life. You know the word “delightful”? That word I never use, because it sounds vaguely Pollyanna-ish, and a bit like you should clap your hands together and beam when you say it? I used it, while reading this book. It did not feel ironic or disingenuous. “I’m reading Julia Child’s My Life in France,” I might say to you, and you might politely respond, “Any good?” “It’s a delight,” I would say seriously. I enjoyed the book for the whip-smart joie de vivre that shone through in every page, for the fact that it came from an age when Julia could talk about the vendors at her open-air market without once mentioning the word “locavore”, for the politics and history woven throughout. It’s been one particular anecdote, though, that has stuck with me. During her time in Paris, Julia makes lunch for a friend…and it turns out horribly. But, “I made sure not to apologize,” she writes. This was a rule of mine. I don’t believe in twisting yourself into knots of excuses and explanations over the food you make. When one’s hostess starts into self-deprecations….it is so dreadful to have to reassure her that everything is delicious and fine, whether it is or not. Such admissions only draw attention to one’s shortcomings (or perceived shortcomings)…Maybe the cat has fallen into the stew, or the lettuce has frozen, or the cake has collapsed—eh bien, tant pis! That got me. Probably one of my worst traits—in the kitchen and out—is that I am overly-apologetic. Not that it’s not heartfelt! I truly am sorry when that bread I baked was a little bit gummy, when those veggies I roasted got a little dried out and frizzled, I’msosorry. These things are often relatively out of my control, and apologies are completely unnecessary, and, more importantly than your gummy bread, I am so happy that you’re here for dinner. I never get around to that second part, though, and the I’msorry’s slip out all over the place until I’m sure they sound meaningless and uselessly self-deprecating. Yet still they come. So, I am resolved: I will be unapologetic. Not brashly so. Just a bit more self-assured, a bit more confident that the act of feeding or loving or making is enough. Because that’s enough, it is!, and we all know it, but sometimes you need Julia Child to remind you of these things. We’re having a housewarming party soon and I can already feel the I’msorrys coming on. We won’t have enough chairs, I’msorry, it will be humid probably, I’msosorry, and really, you don’t have to eat the food if you don’t like it. I might be tempted to cater to the common denominator, throwing together good but kinda boring appetizers that will generate little opportunity for criticism. I will fight this. We will eat blini—with beer in the batter!—and when people say that they look like little pancakes, I’ll laugh and say, “Yeah, they do!” They’re good, really good, with nutty, malty notes begging to be offset with a smear of tangy crème fraîche and maybe some just-out-of-the-ground asparagus. Maybe you won’t like them, Party Guest. That’s okay. I’ll look you in the eye, smile, and point you toward the cheese platter. I made these twice, trying to get the recipe right. The first time, I topped with a smashed broad bean spread with a little olive oil, tahini, and salt, which was good (that’s what you see in the grainy film photos). The second time, with some asparagus from Ben’s boss’s farm, was more than good. 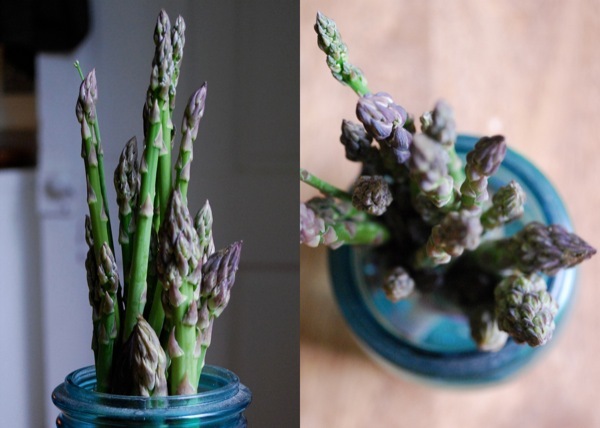 Try it: crème fraîche, blanched asparagus, dill—so good. But really, these are a blank canvas for your spring produce. They’d go wonderfully with the classic radishes and butter on top. They’re also a great vehicle for leftovers and sauces. Various spring veggies, blanched and chopped: asparagus, radishes, etc. Combine the yeast and warm water in a medium mixing bowl and set aside in a warm place for about 15 minutes. Meanwhile, in a separate bowl, combine whole wheat flour, eggs, oil, salt, and beer. It will be very foamy and lumpy at first, but stir with a whisk or fork until smooth and the bubbles have settled down. Now, add the all-purpose flour to the yeast and water mixture. Stir well. Then, add the whole wheat flour/beer mixture to the yeasted white flour mixture. Mix very well, scraping lumps off the bottom. Drape the bowl with a towel and set in a warm place for an hour. After an hour, the mixture should have risen a bit visibly and be frothy. Heat a griddle or cast iron skillet over medium heat, swiping oil or butter over the surface. Scoop heaping tablespoonfuls of the batter onto the hot griddle. Flip the blini with a spatula when the edges look a bit dry and the surface has fluffed up significantly (similar to pancakes). Cook the other side until deep golden brown. Blini should be served warm, so keep all of them piled together on a heated plate or in an oven on low until you’ve cooked them all. Don’t worry about assembling the blini yourself—rather, set up a “blini bar” with all the various toppings in bowls. Bring out the hot blini and allow people to make what they want. Don’t apologize. For some reason I misread the title as “beer bikini” and kept reading, wondering what on Earth that was and how it related to cooking and Julia Child. Guess I’ve got summer on the brain! Ah, I have read and loved all 3 books you mentioned. The “no apologies” Julia Child anecdote has stuck with me too! It’s an excellent rule to live by. Happy cooking! Inspiring to let go of my ‘I’m sorry’s” – so ingrained. I haven’t read “A Circle of Quiet”, but “Walking on Water” is my favorite book of all time and maybe the only book about faith that makes any sense to me. Thanks for the thoughtful post. Ah I loved reading this post. I read My Life in France last summer and I have to say, that book truly was a delight (and I don’t like using that word, either). I remember first reading that part of the book and not being sure what to think– like you I am over-apologetic to the point of useless self-deprecation, but somehow I guess I find it as something of a security blanket thing. I will apologize ahead of time for everything that might not be right, if only to make sure that if someone doesn’t like something, I already got the apologies covered. But after reading this post… I think I might really get what Julia was saying then. You know, there are bigger things than fallen cake or gummy bread or whatever it is. After all, eh bien, tant pis! Thanks so much for this post. Love this post! I’ve been trying to work on my food sorrys, such a habit (I think I got mine from my mother). We had a housewarming too recently and I wish you all the best for yours. I found that if the drinks are flowing and you are enjoying yourself everyone will have a great time and love the food. I wish I’d seen your blinis before our party but now I have an excuse to hold another! It’s not a memoir as such but I can heartily recommend “The Debt to Pleasure”, by John Lanchester – hysterical! Love love book recommendations—will look it up. Thanks! I read My Life in France several years ago, and I agree 100%. Did you know Jacques and Julia is free on Hulu? And those blinis look amazing–I love the fresh spring veg on top. Gah! This totally hit home for me. I’msosorry spills out of my mouth before I cant even be sure what I’m apologizing about, or why. Almost reflexive, right? Like I can’t do much of anything for others without apologizing…it’s amazing how many people feel the same. I’m starting to wonder if this is a woman’s issue more than a cook’s issue. So many are commenting/emailing and saying that their mothers or grandmothers did it, too. Are we just socialized, as women, to be apologetic? Possibly these questions are too big. I love the film photos that you snuck into this post, they have a way of capturing everything that digital cannot. I especially love the one of the bowl on the table – the light is so soft, but descriptive. I am going to download My LIfe in France today and hunker down in a cafe and get lost in Julia’s writing. Her voice so clearly shines through in everything she writes and I love having her wandering around in my head – it’s a ‘delight’. I am guilty of the sosorry dinner party antics as well. I have to remember that when I am a guest all I really care about is being out of the house, away from the kitchen, and in the company of friends. These blinis look delicious. I’ve been thinking about throwing a brunch and these would be a great addition to the menu. Wonderful post. I adore your goal gleaned from reading that book. I wish you well for your housewarming. The blinis look amazing and have inspired me to try your variations from my past trials with smoked salmon, dill, cream cheese. I have been looking for a new food related book to read, I think I will hunt this one day. I love your writing and photography. I love your post, and I love your whole blog! I have read that Julia Child’s book a while ago, and it made me feel soooo good! Thank you for reminding me on that :), I have the same ‘I’msosorry’ thing with taking photographs and posting them on my blog, ‘I’m sorry that they are not the quality I intended them to be, etc….’ as I am still in the learning and experiencing process…..well, you had an impact! Thank you! I’m reading “My Life in France” right now! I’m toward the end. You’re absolutely right – her book is a delight. I didn’t fully understand the adoration of Julia Child until reading this memoir. She is adorable, funny and honest. I feel like we’re friends. I enjoyed Julia Child’s story as well, and your blini look simply “delightful”! Thank you for the inspiration. This is so timely, because I have been recently listening to the same book on my long drive to cooking class once a week. I was struck by the same passage, and recently asked the women in my family about it. We all do the same thing! My grandmother (a fantastic cook) was notorious for exclaiming, “this probably won’t be any good”, before she presented anything she cooked. I too, am working on not apologizing for my food, and owning it- however it turns out! I am really inspired by these blinis and your lovely photography! so well written. i applaud you for these thoughts. That book was so charming! I recall thinking the same thing about cooking apologies: note to self – DON’T! Sigh, I apologize way too much too. Being unapologetic is just another reason why Julia was so awesome. I will have to put this mantra of hers into practice too! I’m reading “My Life in France” and you’ve described my experience perfectly! Simply put, her writing makes me smile. I, too, am excessively apologetic, and have to consciously stop myself from spurting out the “I’m sorrys” I’ve a lot to learn from Mrs. Julia. Your blinis look delicious. Happy Housewarming! Your food is always so…delightful! I think you have such talent with food (oh, and photography-wow!) that there is little need to apologize for little things that are, as you said, out of your control during the cooking process. Best of luck with your housewarming party! eh bien, tant pis! Indeed. I would like to say, also unironically, that this was and is a delight to read. And I too love A Wrinkle in Time, and Bossypants (!! ), and apologize too much. It’s a bad habit, like cracking knuckles; it happens thoughtlessly. I’m going to follow your lead here, with this unbrash unapologetic stance. A Wrinkle in Time lovers are good people. I’ve believed in the no apology approach for a while and loved that passage in “My Life in France”. I think it stems from watching a good friend apologize over and over for food she thought was sub-par but that was made and served with love and was, most of the time, just lovely and it was tiring listening to the apologies and having to reassure all the time. It took away from the food far more than any percieved shortcoming there may have been in the food. So I learned to bite my tongue and only ask my husband if I think I’ve really missed the mark on something because he’ll give me the brutal truth. As an aside I’ve just read As Always, Julia which I found delightful and meaty and such a wonderful depiction of life so, so different from our own. These blinis look wonderful. I’m a pretty apologetic person and sometimes I wish that I wasn’t! Julia Child was a wonderful woman :-) These blinis look lovely and I can imagine the beer batter adds a real depth of flavour. The thing about those ‘Imsorry’ remarks, especially regarding food you’ve made that you find imperfect, is that if you keep quiet about said imperfections, it’s unlikely anyone will be able to see them. We think that perfection is the goal, but it’s damn near impossible. Yet our spongy bread is gold to someone who never eats homemade bread; our over roasted vegetables taste perfect to a person who doesn’t cook at home and any scratch meal is a five-star experience to someone who opens a box for dinner. That passage of the book really resonated with me as well when I read it. And I hear it constantly if someone is making food for me because they think I eat gourmet perfect food every single day and nothing they make can compare. I love having someone cook for me, but the fact that it is so intimidating makes me sad. I’ll eat it. Regardless. And I’ll love it because they took the time and effort. That’s all that really matters. Great point! I stress so much about making dinner for guests because I run through my mind the myriad of things they may not like. And yes, I ultimately make the “safest” meal I can come up with for the pickiest eater present. The irony: I love to try new things! I will always choose the more unusual option myself, out of curiosity, and even if it isn’t my favorite I am always glad that I tried it. I love –LOVE LOVE LOVE LOVE —Madeleine L’Engle. And I ADORE A Circle of Quiet…..I’ve never met anyone else who loves it as much as I do. I just found this blog through Food 52. Gorgeous. Really really beautiful. I’ll be back often. Thank you.. Such a wonderful lesson to take from Julia Child! I believe in the never apologize rule, as most of the time people are happy and enjoy whatever you’ve prepared for them, whether it’s perfect or not. The blinis look delicious, by the way. I very much appreciate book suggestions from my favorite blogs, because I already feel like I have so much in common with you writers I choose to read. Am reading *A Circle of Quiet* right now! Thanks so much for the email and asking my thoughts! I started *A Circle of Quiet* at Christmas and just finally finished it. Loved it. And now I need to go back and read *A Wrinkle In Time* again, especially with her perspective on children and how they can handle “taboo” subjects better than adults! I have two little girls, so I found this challenging. A couple of my favorite parts were her discussion of agape love and her encouragement to be a Christian who thinks in particulars and not generalities. PS. Loved every minute of Bossypants too! I very much enjoyed the post and am compelled to voice a minority opinion. I like the word “delightful”. I find delight each day! Currently delighted with purring cat, cup of coffee and your post! i love this post and dammmmmnit, I must read that book!! It’s been on my t0-do list for years. I learned to resist the urge to apologize from “Cooking Live,” the old Food Network show with Sara Moulton. (She probably learned it from Julia.) It’s so hard to bite your tongue when you can taste all the little mistakes you made — especially for a perfectionist like me — but it makes for a happier meal. Most guests won’t notice, or will think it is supposed to be that way, so I’m happy to let them stay blissfully ignorant. Have a wonderful, unapologetic party! My family got so tired of coming to my house for a meal and listening to me apologize for everything that I finally realized I was spoiling an otherwise lovely time. It’s true that no one ever cares as much about my”mistakes” as I do! I love your food. It’s so similar to how I prepare meals and I love catching a new idea. thanks for your posts and your beautiful photographs. Who needs imsorry when there is beer in the batter. You are too right about that! Oh, how I love this. 1. Julia Child’s My Life in France truly is a delight. I wholeheartedly agree with you. and 2. That part about not apologizing is EXACTLY the part that got to me, too. It is a hard habit to break and one with deep sources (worrying what people think? perfectionism? high expectations? I don’t know), but hearing Julia’s voice and knowing how she looked at it, it encourages me so much. Thanks for a beautiful post. I read ‘My Life in France’ recently and it was so beautiful it made me cry. She is such an inspiring woman and had such an amazing life. I love reading that you felt the same about the book. I sometimes feel isolated in my passion for cooking and food which my friend’s can’t really relate to (though they love to eat what I make), so its so heartwarming to feel connected to people who have the same experiences and reactions to things as I do. Ah, yes – I too can be entirely too apologetic when serving others. As I was reading this, I could hear myself just this last weekend apologizing for homemade ice cream I felt was too milky and potatoes that were taking too long to cook through. But I made homemade ice cream for 20+ people. And that’s enough. A good reminder to have. All 3 of those books have been on my list for a while — can’t wait to get around to them. Ps. YES to A Wrinkle in Time. I’ve been thinking lately about reading it again. I haven’t read it in so many years but still count it as one of my favorites of all time. I recommend a new book by Anna Quindlen. “Lots of Candles, Plenty of Cake” –A fabulous read ! Good to know! Thanks, Karen. Wow: a mention of Madeleine L’Engle (Many Waters is one of my favorites books), a quote from Julia Child and some book recommendations! Quite a pleasure to read this post. Thank you for such beautiful food and photos. I love to cook and one of the things I enjoy most about your writing and photography is the fact that you can purchase such amazingly beautiful veggies! On the east coast, everything we get in our supermarkets comes from another country and may have been on a boat or plane for many days or even weeks. Yours, however make my heart soar and I dream of having those same veggies on my plate. God Bless. I made these for a party last night and they were a huge success – thanks for the recipe! I had a couple left over that made the perfect morning-after brunch, topped with goat cheese and a zucchini, sun-dried tomato omelet. So glad you enjoyed. They’re good vehicles for all kinds of things, definitely. You are currently reading Beer blini at The Yellow House.